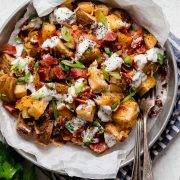 Every now and then, I love to splurge a little and have something deliciously satisfying and perfectly comforting, like this simple and hearty Cheddar Bacon Ranch Potato Salad! 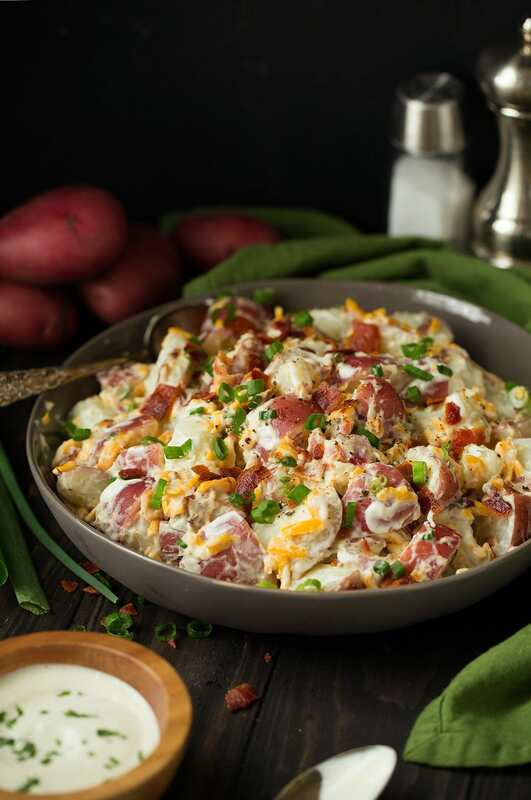 This potato salad only takes 5 ingredients — red potatoes, cheddar cheese, salty crispy bacon, creamy ranch dressing and sliced green onions. What’s not to love there? Yeah, this is a side dish you’ll have on repeat especially during these warmer months ahead. 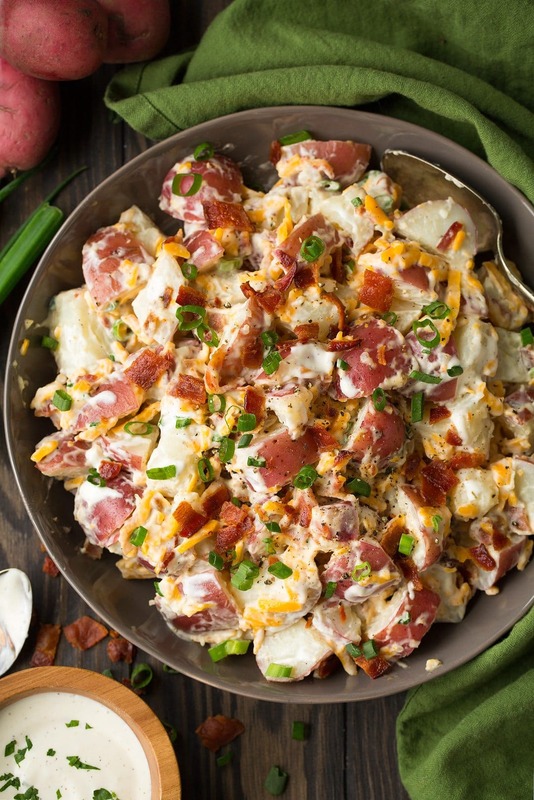 What makes this potato salad with bacon easy to make and why it calls for so few ingredients is because instead of a homemade potato salad dressing, it’s made with a bottle of ranch dressing. I know, normally I’m all about making things from scratch but sometimes when I find a good product, I love a good shortcut. I made this potato salad with the new Hidden Valley® Ranch Simply Ranch Dressing. I’m actually really excited about this product! It’s bottled ranch dressing made without any artificial flavors, preservatives or colors. Instead it’s made with real ingredients like buttermilk, garlic, onion, herbs and spices and I like it better than the original! It has a delicious flavor and of course that same classic velvety smooth creamy texture. 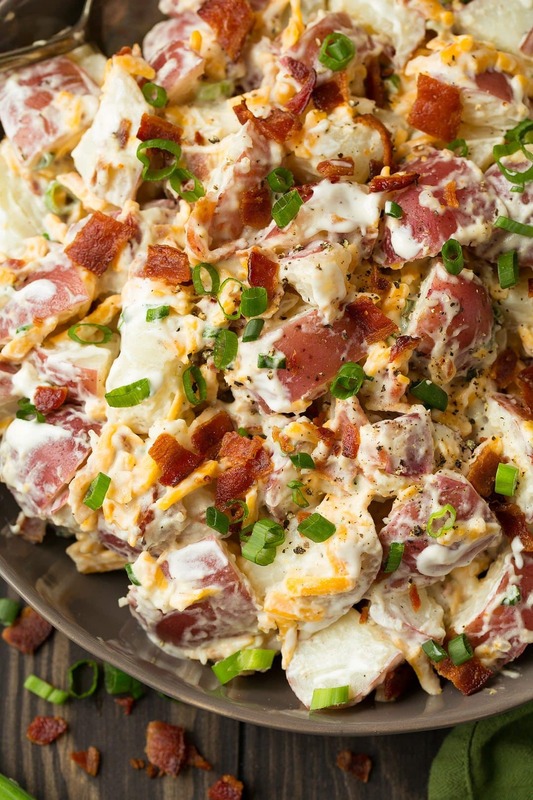 Don’t miss out on trying the ranch with this loaded potato salad recipe, it’s the perfect spring and summer side dish! You can’t go wrong with that bacon cheddar ranch flavor combo. Boil the potatoes until fully tender, then drain and let cool. 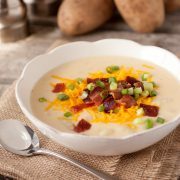 In a large bowl, toss together the cooled potatoes, ranch dressing, crumbled bacon, sliced green onions and shredded cheese. Serve immediately or chill up to 24 hours before serving. How Long Should I Boil Potatoes for Potato Salad? This is a red potato salad recipe, so you’ll need dice the potatoes into 1-inch chunks and then boil for around 10 minutes. Add the red potatoes to a pot of cold water, then bring to a boil. This will give you super tender potatoes for your potato salad. Can I Use Another Type of Cheese? Yes, feel free to use any shredded cheese you have on hand in this recipe. 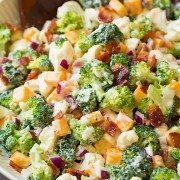 I personally like sharper cheeses, like cheddar, in this recipe, otherwise it gets overwhelmed by the other ingredients. 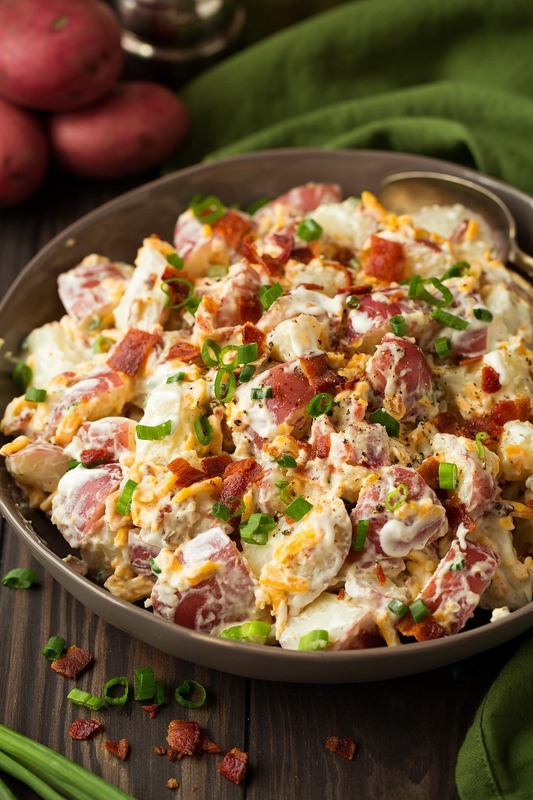 If you want the bacon to be crispy when you serve this loaded potato salad, serve it immediately after making. The bacon loses its crispiness the longer it sits in the dressing. Feel free to reserve some of the crumbled bacon and sliced green onions for garnishing the potato salad. Taste the potato salad after you’ve combined all the ingredients, and add salt and pepper if needed.